Inder Loves Folk Art: School Clothes. Hello, readers! Sewing has been SLOOOOOOOW around these parts, and blogging even slower! Apparently August is a slow sewing month for me - I complained about this last year, and my reasons then were very similar to my reasons this year. It's hot and my kids' drawers are pretty stuffed, so making garments isn't high on my list. My fabric stash is out of control and the WIPs are mocking me. This year, I broke my foot, and although I am getting around pretty well now (I hope to be out of the boot next week), it has put a damper on my machine sewing (I've been doing a lot of hand sewing, though). But Joe starts back at school (1st Grade!) 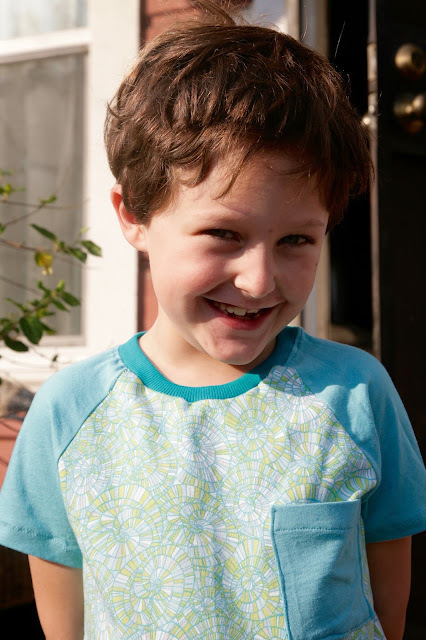 on Monday, so I kicked myself out of my sewing stupor and knocked out a couple of basics for him: two t-shirts and a pair of mustard yellow shorts that I cut out for him last month (this was one of the WIPs mocking me). 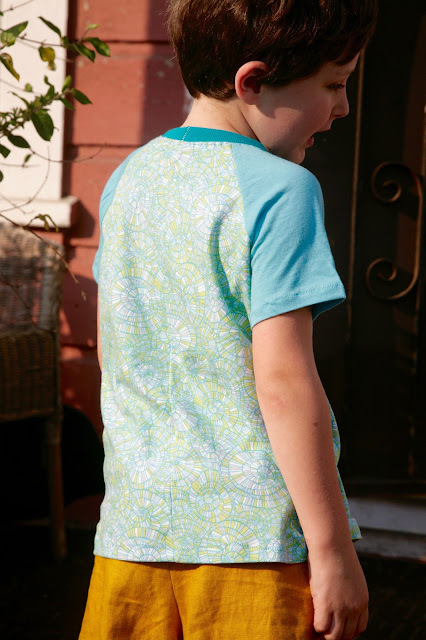 Now that I'm a parent, I realize that part of the reason for "school shopping," or, in my case, whipping up a few new pieces for my kids to wear before the new school year, is to psyche the kid up a little bit for the new year. Joe isn't exactly pumped about starting school again. He's a shy kid, and change is hard for him. As parents, we are emphasizing the positive (seeing his friends again, having a nice new teacher) and hopefully, once the dust settles, he will become quite comfortable in his new situation. But it's fair to say we are all feeling a bit anxious about the transition. But he has a new Darth Vader backpack and now some new duds, so that helps a little bit. I feel better knowing Joe is wearing something I made him, so maybe the ritual helps me as much as it helps him! 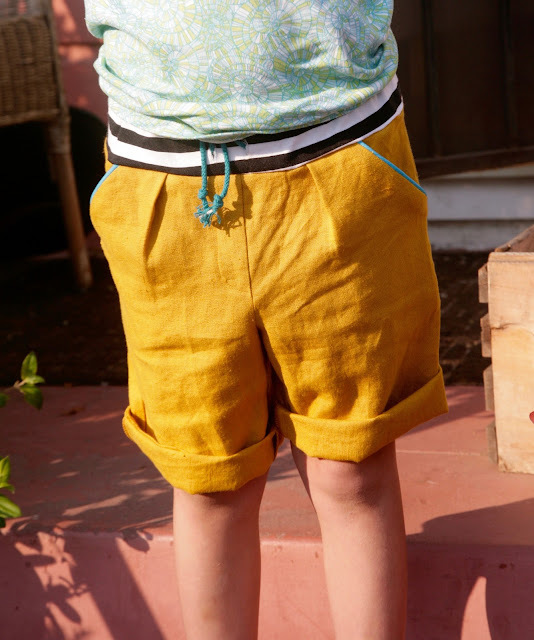 These new shorts (you can see them flat here) were inspired by this pair of Mini Boden shorts, and were also a good stash-busting project, using up a small piece of gorgeous golden-mustard linen and a very small piece of striped knit. 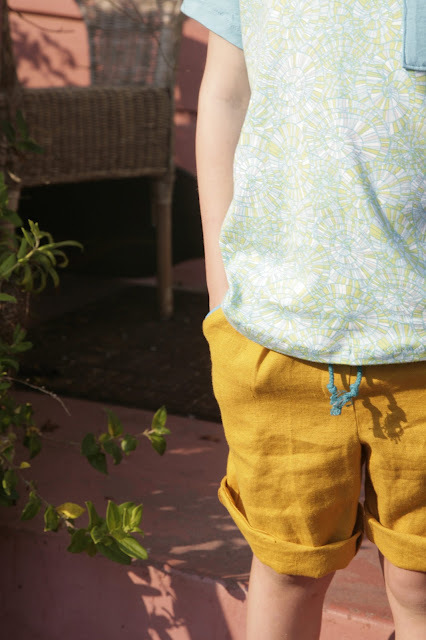 As I mentioned in my last post, my kids are currently obsessed by all things "golden" - while this linen is not a metallic gold, Joe accepted it as "golden" enough to be exciting and acceptable for a new pair of shorts. Since my love of "glorious yellow" is well know, I am only too glad to sew mustard yellow shorts for Joe! Of course, if you hadn't guessed yet, my starting point was the Oliver + S Sketchbook Shorts. Why mess with something I know works for Joe? As with my last few pairs, these have a knit waistband for added comfort. This time I created a functional but also comfortable drawstring waist by making buttonholes at the center front of the shorts, and threading teal cording sewn to an elastic panel at the back, through the waist as well as a tube of solid elastic. That way, the drawstring can be tied in a knot, but does not prevent comfortable wear and movement. I also sewed a little teal piping on the pocket openings. 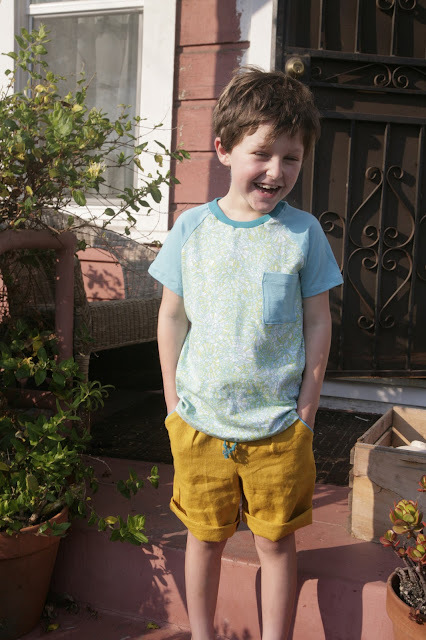 I rolled the shorts up for this photo shoot and to imitate the Boden shorts I was inspired by, but they can also be worn at full length, which is a bit below Joe's knees. The linen makes these shorts extra comfortable and breezy for summertime. We get some of our warmest weather in September. I have some other plans in the works for Joe, including his long-requested "golden shirt." Hopefully I can get back into a good balance of machine and hand sewing soon. I have to say, hand sewing is calling my name lately! But I love seeing my kids wearing and enjoying the things I make for them as well. As usual in life, I suspect there is no true "balance," there is only trucking along doing what I am drawn to do and have time for! Do you make back to school outfits for your kids? Does it help them feel better about their first day back to school? This is a fabulous outfit - I might have to copy the shorts sometime. They are awesome! And I think you are probably right about back-to-school shopping. My girls don't go to school but G is going to attend preschool twice a week this year and I bought him a new blue lunchbox to get him excited about going (I mean, I had to get him a lunchbox anyway but I definitely played up the "LOOK AT HOW COOL THIS IS!" when I showed it to him). ohh I love this! I was just looking through my stash with my boys today to figure out what they need want/ They aren't in school until after Labour day. And I forgot Joe is the same age as my oldest! and my youngest is hitting JK this year (not even 4 he is!) ahhhhh. I to have also noticed August is slooooowwwww.... lol. Yes, he is a total dreamboat! I saw your MiniBoden pin on Pinterest and man, you nailed it! You always have the perfect Pinterest picks! I hope Joe has a wonderful year and you keep on rockin that "golden"! Hugs! School is hard, my younger girls never like going back and it used to break my heart. By about year 2, they have settled but would still rather stay with Mum. Awesome shorts, love the yellow/jade comb.